The Canal Classrooms program, offered by the Park since 2013 and supported by funding from the C&O Canal Trust, provides experiential learning opportunities to K-12 students at three locations: Great Falls, Williamsport, and Cumberland. This is accomplished via STEAM-based curricula (Science, Technology, Engineering, Arts, Math) taught by the Canal Classrooms Corps (CCC), a cadre of retired teachers. Since 2013, over 30,000 students have participated in Canal Classrooms, including many who are economically-disadvantaged and attend Title 1 schools. Plans are underway to begin offering Canal Classrooms in 2018 in Georgetown, with a special focus on increasing participation by DC schools. Your support of the Canal Classrooms program will enable us to provide education programs to more school children each year. Below is a breakdown of donation opportunities. Retired educators with years of teaching experience make up the Canal Classrooms Corps. There are currently 45 teachers, teaching approximately 9,000 students a year at Great Falls and in Williamsport and Cumberland. 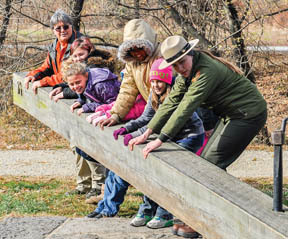 They are trained to teach side by side with the C&O Canal Ranger staff with each one teaching from one to three classes a day (from 30 to 120 students). To help them defray travel and other costs, the Park pays each teacher a stipend of $50 a day. The cost of transporting students to the Park is the greatest impediment for schools wishing to participate in Canal Classrooms. The average cost of a bus for 50 students is $250 with some schools having to find as much as $1,000 to transport all the students in one grade to the Park. In 2013, the Park created a Transportation Scholarship Program. With the support of its nonprofit partners, the Park is able to match any contribution made to the Transportation Scholarship Program, dollar for dollar, doubling the impact of each donation. The Canal Classrooms curriculum is developed in collaboration with local school boards to be integrated with school lesson plans and to align with national and state standards. 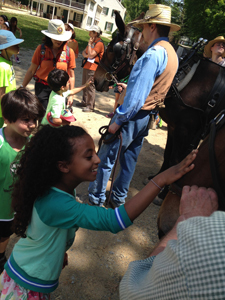 To date, the Park has curriculum programs in Allegany and Washington Counties and is working to continue curriculum development in Montgomery and Frederick Counties, and in the District of Columbia. It costs about $125 to train each classroom teacher about new education programs and supporting resources available to students. In addition, teachers are paid a stipend and are guaranteed bus funding through the Transportation Scholarship Program to enable them to bring their students to the Park for Canal Classrooms in the upcoming school year. TRT presents a unique professional development opportunity for teachers to learn about National Park Service (NPS) resources and how to incorporate them into classroom curricula. 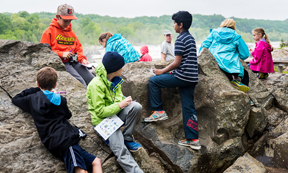 This hallmark NPS program recruits educators from K-12 schools to spend their summers in national parks, developing and presenting educational materials and programs. Following the summer, teachers return to their classrooms where they share their knowledge and experiences with students, fostering support and interest in the local community. Consider making a legacy gift or bequest to benefit the Canal Classrooms program. Learn more here! Major funding for Canal Classrooms is provided by Carlson Family Foundation, the Veverka Family Foundation, and Gary and Tina Mather. You can contact our Development office at 301-745-8880 or [email protected] for opportunities to fund the Canal Classrooms project.